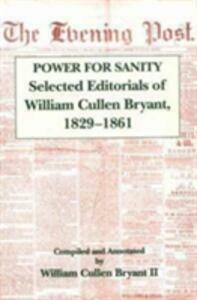 Journalists, 19th-century historians and political history readers should all find this volume of William Cullen Bryant's editorials for the New York "Evening Post" to be a valuable resource. Renowned as America's premier poet, Bryant's ideas and ideologies were deeply woven into the political, social and cultural life of New York and the nation. As chief editor and principal owner of the New York "Evening Post" for 51 years, Bryant's prose became equally influential, punctuated as it was with his characteristic ironic wit and clear-headed arguments which cut to the heart of the issue at hand. The paper had been started in 1801 by another young lawyer, William Coleman, in association with the Federalist politician Alexander Hamilton. Coleman hired Bryant as a reporter, probably based on his emergence as a poet, but Bryant had previous experience as editor and writer for both the "New York Review" and the "United States Review". When Coleman died in 1829, Bryant took control of the paper and brought the conservative journal to the support of President Andrew Jackson and the Democratic party. Free trade, free labour and Free Soil became the defining ideas advocated in the paper's pages for the next 51 years. This volume traces the growth of Bryant's political and social maturity as he made over a conservative, parochial, small-city newspaper into a national organ which in 1850 Charles Francis Adams called "the best daily journal in the United States".